Over the last 30 years, government bond yields have fallen dramatically. This sharp decline from the early 1980s can be largely explained by the shift from a high inflation to a low inflation world. Recently, bond yields have continued their drop and are now sitting at near record lows. While low inflation has helped, the combination of European and domestic problems has been the key driver. While government bond yields may linger at current levels until these macro issues are solved, we believe additional Treasury price gains, which move inversely to yield, are limited. In fixed income allocations today, we would overweight spread product, or non-Treasuries, and reduce duration, or interest rate sensitivity, relative to benchmark portfolios. A vigilant Federal Reserve focused on fighting inflation helped to push bond yields lower since the early 1980s. Evidence of this is in the chart below. 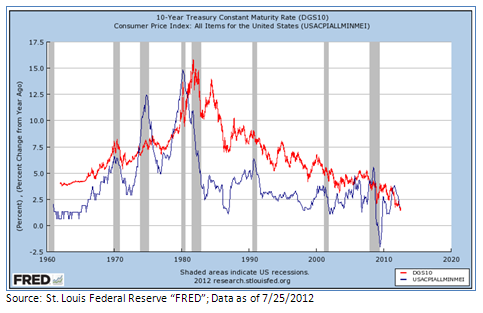 The blue line represents year-over-year inflation (Consumer Price Index), while the red line is the 10-year Treasury yield. With a few exceptions, both have moved in tandem. Safe haven demand for U.S. government bonds has increased in response to the Eurozone debt crisis. Because yields move inversely to price, this demand has helped push yields lower. Sub-par economic growth has further lowered equilibrium levels for bond yields. Market expectations for short-term interest rates have been continuously revised lower. The Federal Reserve has been actively buying government bonds as part of its quantitative easing and "Operation Twist" programs. The above factors have sent bond yields to record lows, benefiting both the consumer and corporations. Low mortgage rates have helped to seemingly stabilize the housing market, while low overall interest rates have helped repair consumer and corporate balance sheets through refinancing and replacement of higher yielding debt with lower yielding debt. Given the unprecedented low yields, we remain concerned that they are poised to move higher, or at the minimum that additional Treasury gains are limited. Despite the Fed's intentions to keep interest rates low, any settling of events in Europe, improvement in U.S. economic indicators, or a pick-up in inflation may reverse the course. Regarding the latter point, as shown in the chart above, the 10-year Treasury yield is hovering around 1.45%, but the June year-over-year Consumer Price Index stands at 1.7%. Because inflation is above this yield, it creates a "negative yield," suggesting that buyers of government debt are paying for the privilege of lending to the government. With the current drought likely to increase inflationary pressures as rising input costs move along the production cycle, we find it hard to believe that yields will move significantly lower. A worsening of conditions in Europe or weaker economic data would negate this inflationary pressure, possibly further sending yields lower. While near record-low Treasury yields may persist until the abovementioned issues, especially in Europe, are resolved, we believe the current risk-reward of Treasuries is unfavorable. As a reminder, given the inverse relationship of bond prices to yield, a rise in yields would hurt prices. Within investment portfolios today, we would focus on spread product (in particular non-Treasury investment grade corporate bonds) and reduce interest rate sensitivity. The increased demand for Treasuries has caused investors to reduce their demand for corporate bonds. 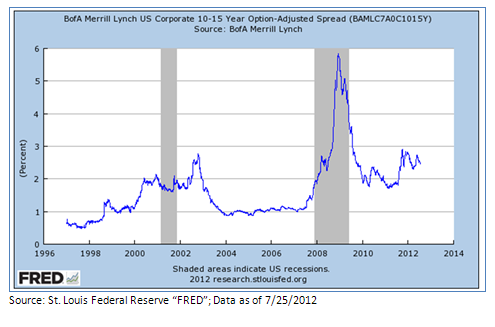 The chart below shows the spread of corporate bond yields over Treasury yields. Ignoring the sharp spike driven by the Financial Crisis of 2008, corporate bond yields remain relatively attractive especially compared to the mid-2000s and late-1990s. If yields do move higher, reducing overall interest rate sensitivity, commonly known as duration, makes sense. To affect that in a diversified portfolio, we would target bond mutual funds with average durations below their stated benchmarks.